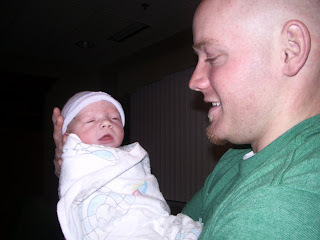 I can't believe a year has already passed since Ethan was born. After having Colin and Cameron on my own, this time around I had to be induced. I wasn't all that concerned about doing it until the night before I went in--then I freaked out. I can't even tell you why. The emotions of it all were just overwhelming me, I think, to know that by 'this time tomorrow' Ethan would be here. There really wasn't all of that speculation like there is when you are waiting for baby to arrive. I knew exactly when he was coming, and unlike the other two, it was a very different feeling. 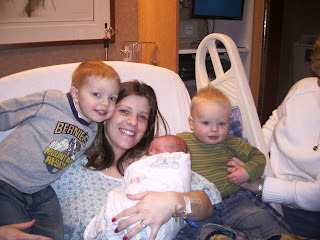 Lynette arrived the night before to take care of Colin and Cameron for the time that I was to be in the hospital. Shane and I woke very early, because I had to be to there by 7:00 a.m. to get everything going. We headed over there, got checked in, and they got me all set up (I should say "hooked up" to everything under the sun....it felt like it anyway). 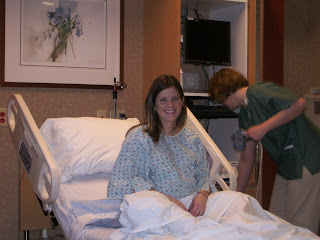 I decided to have the epidural from the get go, and can I just say that I was so glad that I did? I did the whole 'no meds' thing with my other two labors, and it wasn't fun. 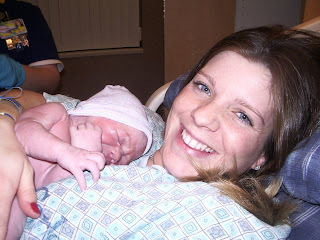 I realize that birth isn't supposed to be fun, and it is supposed to hurt, but I must say that I loved and much preferred this route! I am not going to be ashamed to admit it, either. I was able to rest all day, in comfort (for the most part), and it was great! 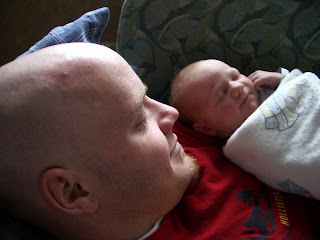 Even though I was on a pitocin drip, Ethan decided that he was going to be moving slow that day. By 4 p.m. , I was only dialated to four. Four! (I came in at three, by the way.) I couldn't believe it. 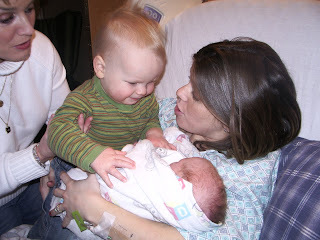 It had been eight hours already....I was so sure that this labor was going to be much quicker than my other two! Well, by 5:50 or so, we all knew that I had spoken too soon. Dr. Shepherd came in and checked me and found that I was complete! Whoo-hoo! I pushed a whopping twice, and Ethan was here! Last shot of the pregnant woman! Ethan had what neither one of my other two babies did: HAIR! I was so excited! We called my mom and Shane's mom, and they brought the boys over shortly after I delievered, so we all got to spend a little time together that night, which was really special! 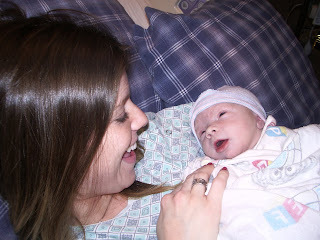 It was just the greatest birth experience, I can't say that enough. 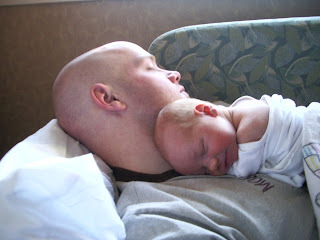 We had a great time visiting that night in the hospital, and for the most part, my hospital stay was wonderful. (I had a couple of complications, but besides that....it was good). 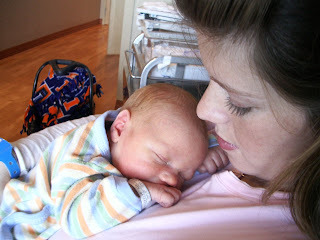 And, my absolute favorite shot of Ethan from the hospital. I wanted to take a shot of him, showing how small he was in comparison with everything else, so Shane and I decided that our hands would make good comparisons! I think the shot just turned out beautifully, and it is one of my favorites EVER of Ethan! 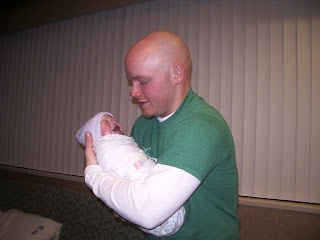 Today, Ethan and I share our birthday. I like celebrating his much more than mine, so today, this post is dedicated to him. 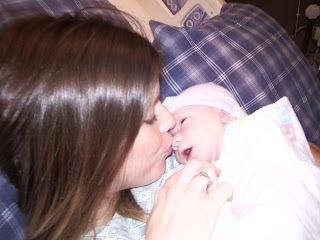 I love you, my sweet baby boy--Happy First Birthday! Happy birthday to both of you! We love you guys! I love that shot of Ethan too, I think that is so precious. Have a fun day. Happy Birthday to you both! He is so cute! I too was induced with Carter a little over a year ago, it seemed like it was going to take forever. 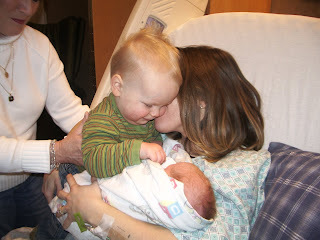 My doc was going out of town later that evening and Carter finally arrived around 4pm...crazy boys! At your request, I posted about the kids' nicknames and how they got them. Hope you'll visit soon and check it out! Happy birthday to you and your sweet baby boy! The pictures are so fun and I'm sure it's amazing to look back and see how much has changed in one year. I hope you both had a beautiful day! Devin- I have really enjoyed reading your blog! I am not even sure how I found it! 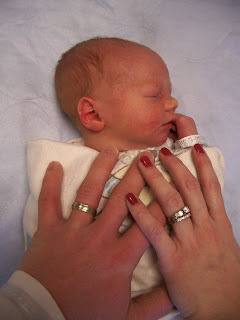 I love the picture with your sweet baby Ethan and your wedding rings! Truly a stunning picture! I look forward to learning more about ya'll through your blog posts! 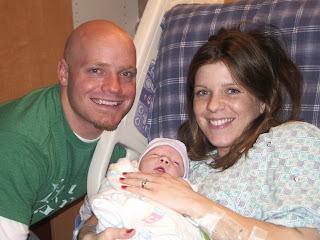 Hey Merrit Family, I found your blog somewhere from Nate & Tricia's blog and I've enjoyed reading your stories. Your family reminds me a lot of mine, and actually we share a birthday (1-31), I thought that was pretty neat! I saw that you talked about Chicago in a post and I thought that was neat too, I'm not far from Chicago myself. Imagine meeting someone online and they live in your own back yard. Your boys are ADORABLE!! Feel free to check out our 'place'. OH MY! that LAST picture?!? be still my Mommy heart! so tiny and perfect and YOU, young lady, who do you think you are looking so beautiful and perfect 5 seconds after having a baby?! lovely pictures!